County Executive Ike Leggett has recorded this video for Council At-Large candidate Hoan Dang. LARGO, MD – Montgomery County Executive Ike Leggett today endorsed Angela Alsobrooks to be the next County Executive for Prince George’s County. During a press event at Alsobrooks’ campaign headquarters, Leggett said Alsobrooks was best prepared to hit the ground running day one and address challenges that impact the county and the region. The endorsement continues to add to the broad and diverse support that Alsobrooks has earned during the campaign. She has also been endorsed by 15 local labor unions representing more than 65,000 working families and all four of the county’s public safety unions. As the primary election approaches and the six Democratic candidates for County Executive make their case, it’s worth considering the incumbent they are seeking to succeed: Ike Leggett. The county’s steady helmsman is approaching the end of a thirty-year career in politics and he deserves much respect for his knowledge, temperament and savvy. But it is Leggett’s greatest achievement that sets an example for all who follow him and poses an important lesson for the next term. Simply put, Ike Leggett saved the county from financial disaster. When Leggett assumed office in December 2006, he was determined to cut back the rate of budget growth overseen by his predecessor, Doug Duncan. In his first budget, Leggett proposed giving MCPS $19.7 million less than its request. That was still a $117 million increase over MCPS’s prior-year budget, but it was a smaller increase than the schools wanted and the education community revolted. The council worked it out. The following year, Leggett proposed a big property tax hike which was mostly passed by the council. These events may seem unrelated, but they weren’t: Leggett smelled trouble coming and he was battening down the hatches. And boy, did trouble come. In 2010, the Great Recession hit the county’s economy and budget with a fury that no one in government had seen before. Leggett proposed what was then the ugliest budget of all time. It included hundreds of millions in cuts and double-digit reductions in many departments. 750 work years were reduced through attrition and position abolitions. A fire truck and an ambulance were to be taken out of service and four police sub-stations were proposed for closure. Employee raises were eliminated and furloughs were instituted. Healthcare for the uninsured was reduced. And Leggett proposed increasing the energy tax by $50 million. To those who object to these reductions, I have a simple message: I do not like these any more than you do… Hard choices must be made, and not just talked about, in this difficult economic and fiscal environment. And then, unbelievably, things got even worse. Revenues were written down twice while Leggett’s budget was under consideration by the council. The county’s FY10 reserves were literally dwindling to zero. Leggett was animated by two goals: save the county’s bond rating and save as many county employees’ jobs as possible. To do that, he was going to have to battle every group that helped him get elected. In the end, Leggett and the County Council worked together to pass the baddest budget ever, a $4.3 billion nuke bomb that had the biggest county spending cut since the current charter was passed in 1968. And that wasn’t the end of it – two more years of not funding collective bargaining agreements and fighting with the school system were ahead. But the bond rating was preserved and mass layoffs were avoided, laying the groundwork for recovery. This was the county’s worst hour. It was Ike Leggett’s finest hour. Leggett didn’t do all this alone. The council stayed with him and all ten of them jumped off the ledge together. But as the Executive, Leggett’s role was absolutely critical. He could have pointed fingers at Council Members who voted for earlier large budget increases, thereby blowing up the teamwork between the two branches that was critical to getting through the crisis. He did not. He could have papered over the problems with band-aids and said next year would be better. That would have been very tempting for Council Members to go along with – let’s remember that 2010 was an election year. He did not. He simply told the truth and made the hard choices the voters paid him to make. And in the end, it worked out. Your author has had many policy differences with the administration over the years and the Executive is leaving significant unfinished business for his successor, as all Executives have done. But let’s recognize a central truth. Leaders are not remembered for doing twenty small things really well or maybe not so well. They are remembered for how they deal with a crisis. Ike Leggett passed that test. And now we are charged with picking Leggett’s successor. The economy is not healthy enough to pay our bills and the county is now resorting to quick fixes to balance the budget. The entire Washington region is not as strong as it once was. Most ominously, since the average business cycle lasts 5-6 years, we are due for a recession during the next term. That doesn’t guarantee that the next one will be as bad as the earth-shattering Great Recession, but it won’t be fun. The voters are about to make a judgment on which group of elected leaders will deal with our coming challenges. Bearing in mind the example set by Leggett, who deserves your support? There are important policy issues at hand, but on the personal traits of the candidates, here are a few ideas. Vote for adults. We will be well served by people who do their homework, take their responsibilities seriously and are willing to do the thankless chore of reading hundreds of pages of dreary, bureaucratic reports on everything the county does. People who are not interested in that kind of drudgery will not be equipped to make tough but intelligent decisions. Vote for civility. This is one of Leggett’s greatest strengths. Sure, he will push back on what he sees as inaccuracies or misrepresentations but he preserves his ability to work with everyone. That paid off in a huge way during the Great Recession. Elected officials who blow up at others won’t be able to assume a unifying role in an emergency. Vote for honesty. If someone tells one group one thing and then tells another group something completely different, be skeptical about that. Trust the person who says no when necessary and not yes every single time. And someone who tap dances all over the place on his or her record and positions is not going to be a reliable leader at crunch time. Most of all, vote! And do your best to make sure that the people you pick are ready to deal with the next crisis – just as ready as Ike Leggett. County Executive Ike Leggett is threatening to veto a line item in the Capital Budget just passed by the County Council related to his proposed stormwater reforms. While the county’s charter grants the Executive line item veto power, we don’t recall the last time this was actually used. He also expressed displeasure that the council added $14 million of new spending on top of his proposed budget. We will have more to say about this, but for now, we reprint the Executive’s press release below. “I appreciate the hard work and leadership the Council demonstrated on the FY 19 Operating Budget. The Council approved virtually all of what was initially recommended, including full funding for Montgomery County Public Schools — our shared top priority. “I am concerned, however, that the Council has increased ongoing expenditures by $14 million over and above my recommended budget. “In addition, by a 5 to 4 majority, the Council opposed the reform of our stormwater management construction program – a decision that threatens our ability to meet important environmental goals and will certainly delay projects designed to meet our State-mandated MS4 permit — I intend to veto this line item in the Capital Budget. Danielle Meitiv frequently reminds us that she is a scientist. Then one should wonder why, when she accuses our County Executive of failing to endorse women candidates, she fails at one of science’s most basic tenets – sample size and probability of drawing a false‐positive conclusion when the sample is too small. According to one of the country’s top science organizations – the National Institutes of Health (NIH) – sample size is important. In the NIH publication, “How sample size influences research outcomes,” NIH says: using a sample smaller than the ideal increases the chance of assuming as true a false premise. 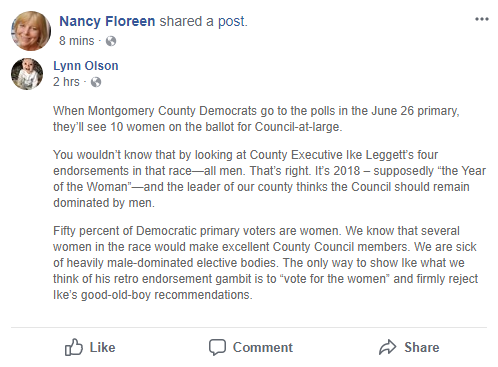 So when Ms. Meitiv draws the conclusion that our County Executive is not interested in gender balance because of his endorsements in the Council at-large race, one might ask about how Mr. Leggett’s track record stacks up in a larger sample size. For example, when one looks at all the candidates he has endorsed in the current election, one sees that it includes four women: Aruna Miller, Lily Qi, Charlotte Crutchfield and Rebecca Smondrowski. Interestingly enough, that equals 50% of his total endorsements. And with his endorsement of Aruna Miller, he was out up front and early when many were hanging back. Look carefully at Mr. Leggett’s endorsements. They are not only gender balanced, but they are rich in diversity as well. It is important to note that this County has never elected any Latino or Asian for an at-large seat. And, Mr. Leggett is the only African American ever elected to an at-large office. Where has Ms. Meitiv been in furthering this goal of diversity, correcting these deficiencies? She criticizes Mr. Leggett only because it benefits her as a candidate. It gets her publicity. Look also at the top tier of management in County government appointed by Mr. Leggett. Twenty-two of the 44 top managers/directors are women. Again, 50%. He has been highly successful in advocating for gender balance and diversity on a number of fronts. He has advocated with our governors for a more diverse judiciary, including recommending many women for judgeships, who have since been appointed. He has endorsed many women for elected office in the past. The examples are too numerous to list. In fact, you will not find any leader anywhere who has such a track record of fostering diversity and gender balance in so many facets of public life to equal Mr. Leggett’s. It is truly unfortunate that Ms. Meitiv lashed out without facts, and as a result, failed this science test. Joy Nurmi is a Special Assistant to County Executive Ike Leggett and a former Chief of Staff at the County Council. County Executive Ike Leggett’s decision to endorse four men in the Council At-Large race – incumbent Hans Riemer, Gabe Albornoz, Hoan Dang and Will Jawando – has provoked public accusations of sexism from two women who are running for office. 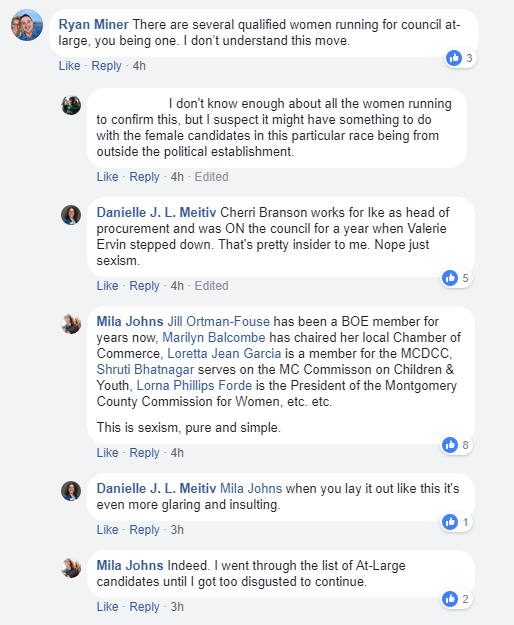 District 18 Delegate candidate Mila Johns followed up, directly accusing Leggett of “sexism, pure and simple,” and eventually shared Meitiv’s post on her own page. Council Member Nancy Floreen also weighed in on this, although somewhat indirectly. For many, 2018 could be the year for women, people of color, and working people, but not if we aren’t actively changing our political system both internally and externally. Maryland has one of the worst records in the country on gender parity: we rank 38th on the gender parity index with a score of 12.1 (down from 21.2 in 2014) with few women in federal, state, or local office. To be clear, the four men who have been endorsed by the county executive are qualified candidates — that is not the question. However, not endorsing a single woman running at-large sends the wrong message about how our political and elected leaders view gender parity. Some will argue that more of the women running should have sought the endorsement. Unfortunately, this view continues to fault women instead of asking why our leaders aren’t being intentional to seek women to endorse as well. It continues a pattern that leaves many on the margins. Thankfully, there are many strong women candidates running for office in 2018 to change this status quo, and I’m excited to be one of them. If Leggett’s choices win, it’s possible that the council might have just one female member in its next term: District 4 incumbent Nancy Navarro. Since its current structure was established in 1990, the nine-member council has never had fewer than two female members and has sometimes had three or more. Additionally, the issue of how women are treated in politics has erupted in Annapolis as the General Assembly grappled about how to deal with harassment in its most recent session. One at-large candidate (Delegate Charles Barkley) has even been accused of inappropriate behavior with women. Riemer, Albornoz, Dang and Jawando are not unusual choices for Leggett. The Executive has had a cordial relationship with Riemer during their time in office together. Albornoz is widely regarded as one of his best department directors. Dang and Jawando are solid candidates and both would bring assets to the council if elected. 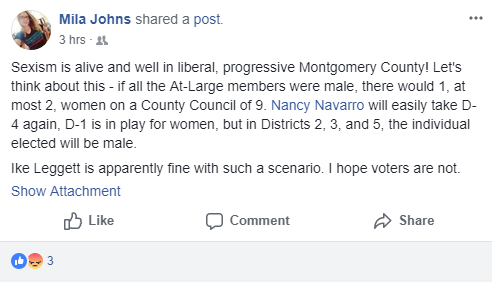 But surely Leggett and his team should have expected pushback on this in the wake of his criticism of the District 39 state legislators for accepting Lesley Lopez on their slate, a dispute in which gender was raised as an issue. In Leggett’s defense, he has filled his administration with strong and competent women, including but not limited to Department of Permitting Services Director Diane Schwartz-Jones, Office of Management and Budget Director Jennifer Hughes, Health and Human Services Director Uma Ahluwalia, Assistant Chief Administrative Officer Lily Qi, former libraries director Parker Hamilton and Special Assistant Joy Nurmi. (Some of these ladies have left multiple boot prints on your author’s rear end!) Leggett’s wife, Catherine, is an admired player in county politics who chairs the Executive’s Ball and raises money for the arts. We are sure that Leggett’s MANY female supporters will step up in his defense should they deem this criticism worthy of response. So who’s right? That’s for you, the readers, to decide. County Executive Ike Leggett has endorsed Council At-Large candidate Will Jawando. The Executive has previously endorsed Gabe Albornoz (his Recreation Director), Hoan Dang and incumbent Hans Riemer in the race. We reprint Jawando’s press release below. ROCKVILLE, Md. 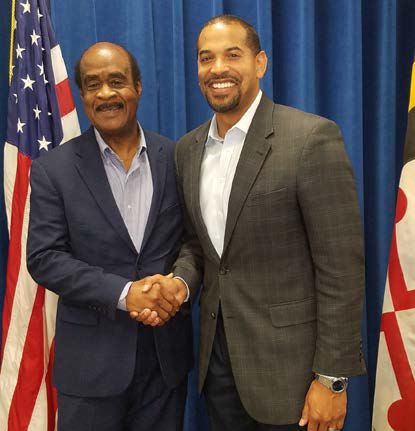 – In a statement released today, Montgomery County Executive Isiah “Ike” Leggett endorsed Will Jawando in his race for County Council At-Large, noting Jawando’s record of public service and progressive leadership. If Jawando wins his contest, he will be only the second person of color to be elected to a county-wide office in Montgomery County. Leggett was the first, and only to date. Jawando recognized that when he welcomed Leggett’s endorsement. Aside from creating and managing the first year of Summer R.I.S.E., and his work on the Montgomery County Commission on Juvenile Justice, Jawando co-chairs the African-American Student Achievement Action Group, and created a community-based non-profit called Our Voices Matter, which works with underrepresented populations to increase civic engagement, voter registration and leadership training. To learn more about the Montgomery County Promise, please visit www.willjawando.com. County Executive Ike Leggett has endorsed Council At-Large candidate Hoan Dang. This is a nice boost for Dang as we have not heard of Leggett endorsing anyone other than incumbent Hans Riemer and his Recreation Director, Gabe Albornoz. We reprint Dang’s press release below. 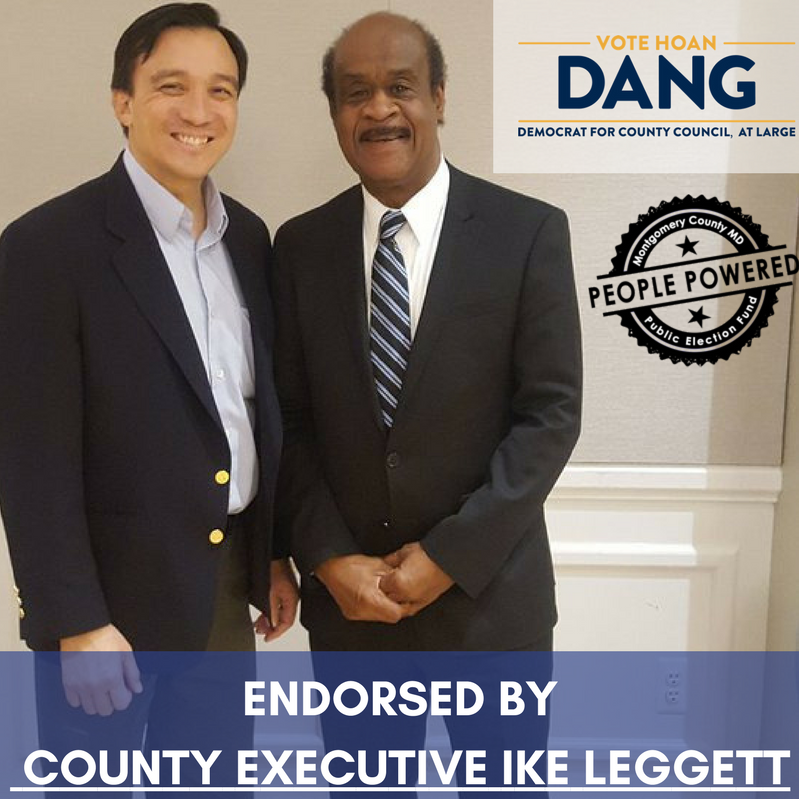 Silver Spring MD — Today, County Executive Isiah “Ike” Leggett endorsed candidate Hoan Dang for Montgomery County Council At-Large. Hoan Dang has also been endorsed by: Delegate Henry “Hank” Heller (D19, ret), Darrell Anderson (Mayor of Washington Grove, ret), Reggie Felton (Board of Education, ret), Henry Lee (Board of Education, ret), Madaleine Sigel (Woman’s Democratic Club, ret), Michael Lin, (Organization of Chinese Americans, ret), Jae Shin (League of Korean Americans-Montgomery County, ret), Montgomery County Public Schools Retirees Association, and The Progressive Vietnamese American Organization. For more information on Hoan Dang and about his candidacy, visit www.votedang.com. 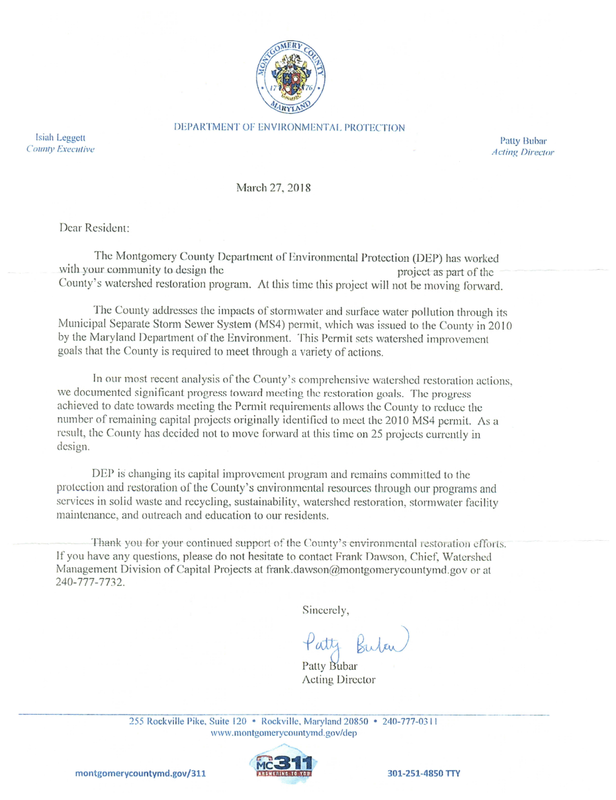 Montgomery County’s Department of Environmental Protection (DEP) has sent letters to residents announcing the cancellation of 25 stormwater projects currently in design. We reprint one below. We have redacted the name of the specific project to protect the recipient of the letter. We have two questions. First, why are these cancellations being announced considering that the county has agreed to a consent decree requiring that the county build a number of unspecified “supplemental environmental projects” because it did not meet the terms of its state-issued stormwater permit? And second, if the county really can cut its project count and remain in compliance with its stormwater permit and its consent decree, will its water quality protection charge – which has been increased by more than 1100% in the last fifteen years – be reduced? After all, the purpose of that charge as well as the bag tax is to finance these projects. Elected officials and candidates for office, we respectfully request that you ask questions about this. By Kit Gage, Advocacy Director, Friends of Sligo Creek. Montgomery County, like the rest of Maryland and particularly the developed parts of the Chesapeake region, is full of parking lots and roofs and other impervious surfaces. All these hard surfaces have made for a relatively terrible environment – pollutants, worse flooding and droughts have been the result. The federal Clean Water Act thru the EPA, and the state of Maryland, require us to create projects that help our rivers, creeks, and the whole area better absorb stormwater. Litigation has enforced doing this work. So Montgomery County doesn’t have a choice about proceeding full speed ahead to do active stormwater collection and infiltration. 1. Cancelling projects that are in process – already designed, locales evaluated, etc., is inefficient and costly. The county can finish these projects – or almost all of these projects – by getting bids from approved contractors as it already does and so do them quickly, efficiently and relatively inexpensively. 2. We understand there may be other agencies using the Water Quality Protection Charge for other than stormwater projects – if this is true then that should be fixed, rather than limiting access to stormwater funds by the lead agency, the Department of Environmental Protection (DEP), and Parks that are doing these projects. Their efforts over recent years have helped them learn how to do them better, more quickly, and more cheaply. 3. There is no evidence that the Public Private Partnership (P3) is better. There is some evidence that some of the nearby P3 projects don’t provide the more effective and environmentally sensitive solutions that should be required for good stormwater collection, infiltration, and wildlife support. Starting a brand new process for contracting is almost certain to be disruptive and inefficient, particularly to projects in process. Is there room for improvement? Sure. We could be planting lots more trees. We could do more projects like conservation landscapes in peoples’ yards, schools, and other institutions. We could be changing the way we handle turf – reducing use of pesticides and fertilizers at the source, mowing high, aerating and soil testing to have grass act better to capture and soak in stormwater. These things are cheaper and easier to do. But don’t take responsibility out of the hands of DEP. Let’s fix any problems, not create new ones.